Boston, September 11, 2018: Rainbow Cup Charity Volley Ball Tournament supporting Team Aid was successfully conducted at Greenhill Park Worcester. The tournament was declared open by Mohan Nannapaneni of Team Aid. It was a beautiful fall like weather day, decorated by festive mood with all participants, their families, and energetic volunteers. 20 Men's teams competed for the Volley Ball Trophy and 5 Women's teams for the throw ball trophy. The event is well attended by over 300 sports loving crowd cheering up the players and volunteers. Nerupuda Team won the Men's volley Trophy for the 3rd successive time, Don Reedy Fan Club took home the runner Trophy. Westford Warriors won the silver level trophy for the volleyball. Rainbow cup Charity team organizers explained to the crowd how unique organization Team Aid is in providing support to the Indian Community in emergencies, and were cheered by the crowd when they handed over all the proceeds from the tournament to Teamaid representatives. Healthy Snacks and delicious lunch was served with generous sponsorships from Mayuri Indian Cuisine Westborough, Dharani Restaurant Westborough, Godavari Framingham, Bawarchi Biryani Framingham. 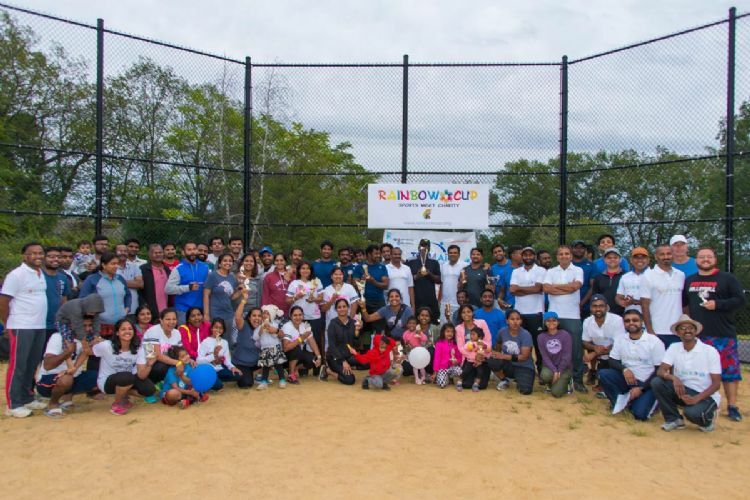 The tournament was also sponsored by Ravi Prakash Foundation, Rx Advance, Advalent Systems, and Dr Babu Pediatrics Worcester. The organizers thanked all the sponsors, players, volunteers for their support and closed the event with a hope to serve for this great cause again next year. TEAM Aid is the only non-profit organization, exclusively providing assistance to the Indian Community that are affected by the catastrophic incidents such as accidents, murders and suicides etc. It has volunteers almost all major cities in the USA, Canada, some parts of the middle East and Europe.